Your GeoDirectory site uses a number of special templates to create your map pages, category pages, detail pages etc. You can find the default templates at /wp-content/plugins/geodirectory/geodirectory-templates. The default templates at /wp-content/plugins/geodirectory/geodirectory-templates. Navigate to your child theme. Create a folder in your active child theme folder called geodirectory. Find the template you want to customize. 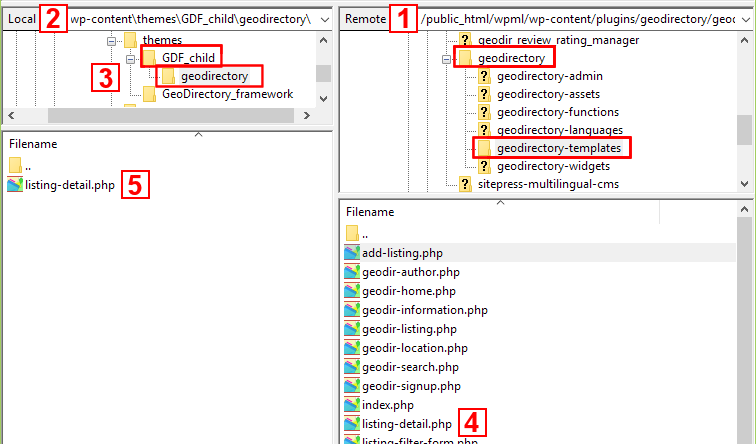 And copy that template to the geodirectory folder in your active child theme. You can then change the original templates and insert any code needed to adapt the templates for your site or theme. By creating a copy of the template to your child theme, you will preserve all your changes when the plugin needs upgrading. The two files login_frm.php and reg_frm.php are called in the template geodir-signup.php, you can replace this template but there are easier ways , adding the code below to your child theme functions.php will then allow you to replace those two files as the same way as all the others via the above method.